I am a sucker for loaded salads in the summer. I especially dig salads that are substantial and filling enough to stand alone as a meal. This Mexicali Loaded Salad Bowl is one of those salads. I love that loaded salads are usually a pretty economical choice as a summer meal option ... one or two chicken breasts, for example, can be stretched in a salad such as this one to feed like, four people. And, although the ingredient list may appear to be a little long, everything is super inexpensive and many are items we tend to have on hand. This salad starts with a base of crisp iceberg lettuce. 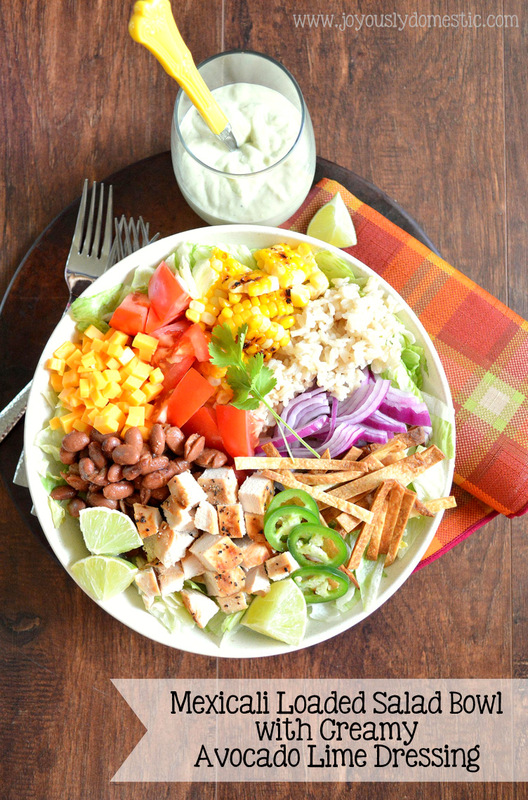 Then, ingredients like, seasoned grilled chicken, brown rice, crispy tortilla strips, grilled corn and beans are simply arranged atop the lettuce in a large serving bowl in whatever manner you desire. This monster of a salad then gets served with a creamy avocado dressing and lots of lime wedges. It's a salad that's bursting at the seams with flavor and is laden to the hilt with amazing textures. It's the perfect combo of fresh veggies, tender bites of chicken, citrus zip, a touch of heat and a whole bunch of deliciousness. Pair with a cold beer and you've got yourself one winner of a summer salad. Prepare dressing by blending ingredients together in a blender or food processor until smooth. Add additional milk as needed until desired consistency is achieved. Store dressing in refrigerator until shortly before serving salad. Next, prepare the chicken and corn. Brush chicken breast and ear of corn with olive oil. Sprinkle cumin, chili powder and salt onto both sides of chicken. Cook chicken on an indoor grill pan set over medium heat - flipping once - until cooked through and juices run clear. (Internal temperature should be 165 degrees.) During that time, grill corn next to chicken - rotating corn during cooking to achieve a little charring around all sides. Remove both from pan and place on a plate to rest. "Tent" chicken using foil to keep it warm until ready to serve on salad. Cut corn kernels from cob. Assemble the salad by laying down a bed of lettuce at the bottom of a large serving bowl or platter. Arrange the tomato, rice, chili beans, onion, cheese, corn kernels, tortilla strips and jalapeño as desired. Cut chicken into chunks or strips. Serve atop salad. Add lime wedges and cilantro. NOTE: To make the crispy tortilla strips, preheat oven to 350 degrees. Then, simply cut 1 - 2 small soft tortillas into thin strips using a knife or pizza cutter. Arrange in a single layer on a baking sheet and lightly coat with a little oil or cooking spray. Bake until strips are lightly browned and crisp - about five minutes. (Watch closely so that they do not burn.) Remove from oven and lightly season with salt.